I can’t believe it is the last week of August. Where did the summer go? We are excited for September because our due date is September 24th. We have less than a month to go! We are also looking forward to Labor Day-which is this upcoming weekend. 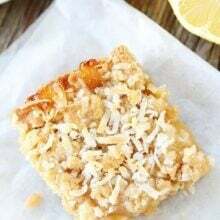 Hopefully, it won’t be my Labor Day-we are excited to meet our little guy, but he needs to stay put for a little while longer:) We always have a barbecue on Labor Day and this year I am making Lime and Coconut Crumble Bars for one of the desserts. These bars are special because they have a thick crust and crumble topping. A crumble topping is always a bonus in my book. The bottom layer and topping are made with butter, brown sugar, oats, and coconut. The middle layer is made with sweetened condensed milk, vanilla extract, lime juice, and lime zest. The lime filling is thick, creamy, and tart. The bars are simple to make and remind me of key lime pie. No wonder Josh loves them-key lime pie is his favorite dessert:) He had a hard time waiting for me to take pictures of these bars. He kept trying to eat the one I was shooting. I eventually let him dig in:) He didn’t even leave me a bite! 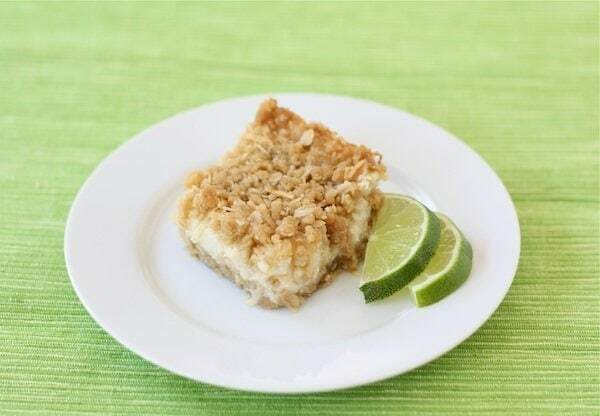 If you are looking for an easy dessert to serve at your Labor Day party-make these Lime and Coconut Crumble Bars. Lime and coconut lovers will devour these refreshing bars. 1. Preheat oven to 350 degrees F. Grease a 8×8-inch baking pan and set aside. 2. In a large bowl, cream together butter and brown sugar. Add in flour, baking powder, and salt and mix until everything comes together in a crumbly mixture and flour is evenly distributed. Mix in oats and coconut. Mixture will be somewhat dry and sandy. 3. In a medium bowl, whisk together sweetened condensed milk, vanilla, lime juice, and lime zest. 4. Put 2 cups of the oat mixture into the bottom of prepared baking dish and press firmly into an even layer. Pour lime mixture on top and spread evenly. Crumble all remaining oat mixture over the top of the lime mixture, covering it completely. 5. Bake bars for 30-35 minutes, or until golden brown. Cool completely on a wire rack. Cut into squares and serve. Store remaining bars in the refrigerator. Wonderful bars! That exotic combo is delightful. your description of those bars is pretty much heaven! and then the crumble topping and i agree, crumble toppings are a bonus!! it’s like a key lime pie meets a crumble bar all in one. love it. P.S. I’m so excited for you that you’re in the home stretch. Eee! 🙂 I bet you can’t wait to meet the little one. you are soooo close girl! and lime and coconut? hand ’em over. yum. Love the pictures. Going, going, gone! Pete loves anything coconut and lime, I’m sure he’d love these! Ooooh, these are a perfect summer ending dessert! 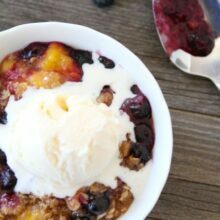 I’m a citrus girl, and I love a good crumble! I have to make these!! 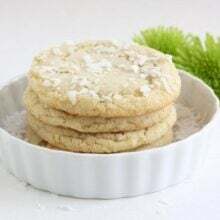 my husband loves coconut and his bday is around the corner – these will look so cute with a candle in them! Oh wow… these look so delicious!!! 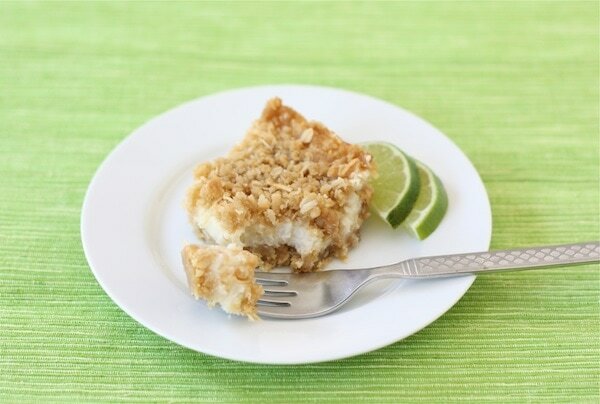 I love key lime pie, the addition of coconut sounds so good! This recipe sounds so summery, perfect way to wrap up the season. Cue music: It’s FINAL COUNT.DOWWWWN. So exciting, Maria! And those crumble bars just made my heart crumble with joy. Oh the things I am giving up for this baby!! My mouth watered when I saw this!! Unfortunately she (and I) can’t have dairy. Working hard on a dairy free version so I can enjoy these! Thanks for posting!! I thought I knew what I was baking this week…but plans can change. These look amazing and combine my favorite flavor pairing! Amazing Maria! I have stumbled these and Pinned them! They are on my “to make” list FOR SURE! Oh Maria Maria- these were made for me! (Betcha didn’t know that, did you? Why didn’t you send me some??) Seriously, can’t wait to make them- they look fab! I know, summer seems to have flown by this year! Although I’m sure I say that every year b/c I love summer and hate to see it go. So exciting that’s you’ll be meeting your little guy soon! I’m obsessed with coconut this week, ever since I started using coconut oil instead of olive oil. I’m going to try it with these too and be over the top coconutty. Oh my… two of my favorite flavors in one of my favorite types of dessert bars…. well, so much for the diet … but these are worth it… Yum!!!!! What’s a better combo than lime and coconut? I can’t think of a single thing! Mmm, these bars look so delicious and moist and full of flavor… I agree, the summer seemed to fly by this year. 🙂 What a wonderful new addition you have to look forward to in the fall! What a great recipe. I love using sweetened condensed milk for desserts. The picture is so beautiful too…and it matches your site’s them colors perfectly. oh my gosh sept 24 is my bday. These would be a huge hit in my home – yum! Yummy……I’m a great fan of coconut and recently made some coconut pancakes so the coconut bars are right up my alley. Enjoy the last few days of summer! Sounds like September is going to be a wonderful month for you guys!! I love anything that resembles key lime pie, so I will definitely be giving these a try! They look delicious! Love the looks of this recipe. I love anything lime and coconut. Hope the last month of your pregnancy flies by. Mine has dragged a bit. I’m currently 5 days overdue… yuk! Wishing you a speedy labor and a happy healthy baby! September is just around the corner! I wish you have a little hour (that’s what we use to say meaning an easy labor). 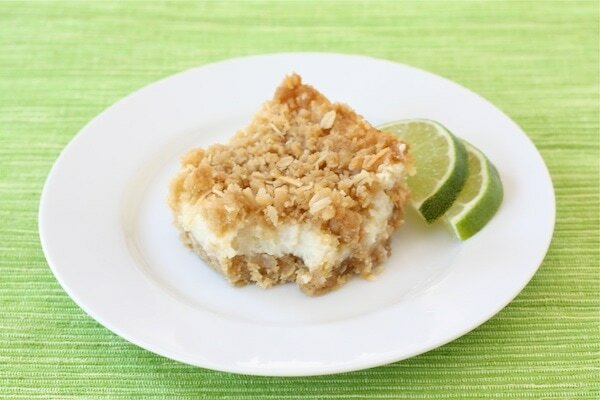 I love the idea of your lime bars with coconut. 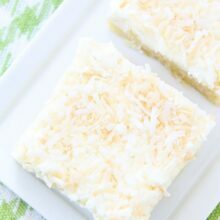 I made something similar but just with lemon; coconut sounds like the perfect addition and lime is my latest weakness, oh my! Thanks. Yay! He’s due on my birthday! 🙂 I WILL be making these. I’m having a hard time not drooling right now – love that flavor combination! sweetened condensed milk center and butter tops and bottoms – sounds like heaven! love this! Yum. I love that there’s as much crust and crumble as there is filling! They look great, and perfect for a last dash of summer! 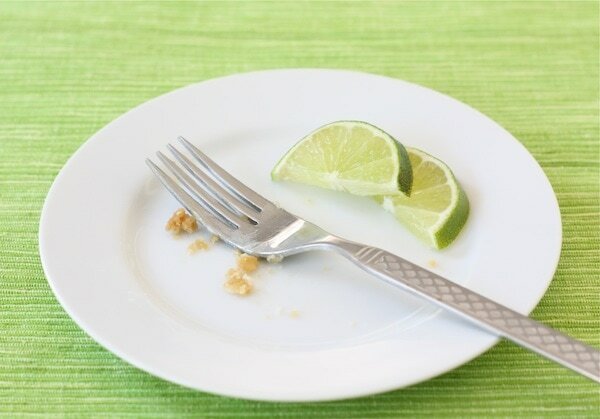 I love key lime pie and I am sure I could eat this whole dessert and never share a single bite! These sound so good. 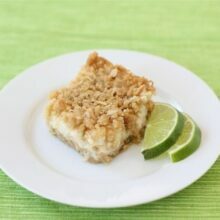 I love key limes and lemon bars so I know I would adore these especially with the crumble topping. Great recipe. Thanks for sharing. I know I’m a little late to this post-but oh my gosh I made these and they are fantastic!!! It was so easy and impressive and yummy. The only thing was I couldn’t taste the coconut, maybe add more next time or would that change the texture? Man, they were so good!! Almost there, Maria and Josh-so happy for you both to bring your lil’ sweet pea into this world! I made these today, they were so yummy! Thanks for the recipe. In Seattle, we have a local street food truck “Street Treats” which makes the most awesome coconut lime bars… in fact, I am addicted… anyway, I’ve missed the truck somehow for the past month and was craving these bars… well, your recipe was nearly 95% accurate… and solved my addiction! Delicious, thanks for sharing! Hi! Just wondering if you could make this recipe with quick oats. Thanks so much! Made these twice!! Easy and big hit. Now one of my go to’s!! Just discovered your blog recently – I just love it! I think that these bars will be the first recipe I try, they look delicious. Just wondering – can I use my 8 x 8″ Pyrex baking dish and will the baking time change? Thank you. Yes! I use a Pyrex baking dish too! Thanks for reading our blog! Can this be doubled and baked in a nine x thirteen Pam? If so does the bake time or temp change?